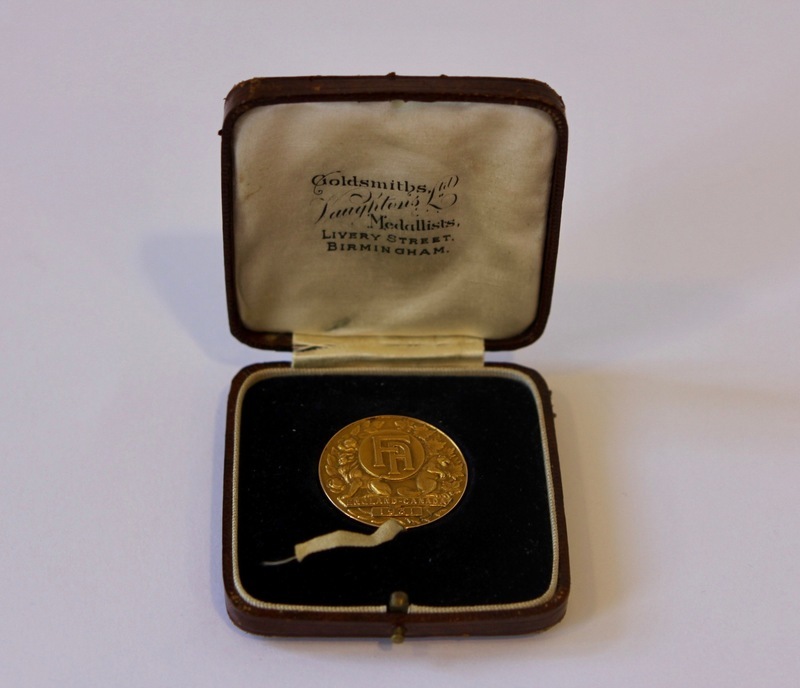 This gold medal was presented to Harold ‘Happy’ Houghton for his participation in the England-Canada Football Association Tour of 1931. Houghton was the only Exeter City representative in an extremely successful English side. The gold medal was crafted by Vaughtons Goldsmiths and Medallists and embossed on both sides, representing the national symbols of both England, the lion and rose branch, and Canada, the beaver and maple leaves. The medal also features the Football Association logo, the ‘England-Canada 1931’ tour and the recipiants name ‘H. Houghton’. The 1931 England-Canada Football Association Tour featured a team of an assembly of players from various clubs, and Houghton was the only Exeter City representative. The tour took the team to locations across Canada, including Montreal, Toronto, Winnipeg, and Hamilton. Playing as a forward, Houghton scored 9 goals over the course of the tour. This ‘FA XI’ tour, as it was called, was one of many organised by the Football Association. The first official tour took place in 1899, and the 1931 Canada tour was the tenth tour organised by the FA. Since their inception these international tours have taken players all over the world, including the USA, South Africa, Australia, Israel, and Southeast Asia. Nonetheless the matches were usually not recognised as full internationals, and no caps were awarded. Teams were composed of players representative of the four British football associations – the English Football Association, Scottish Football Association, Football Association of Wales, and the (Northern) Irish Football Association. Harold ‘Happy’ Houghton was born in Liverpool, England in 1906. He was an England schools international in the 1919-20 season, then at the age of 15 was signed on as an amateur for Everton before becoming a professional a year later. Despite his lack of first team experience, Exeter City paid a fee of £350 for his signature in June 1928. Houghton made his debut for the Grecians in a 4-2 defeat at Brentford on the opening day of the 1928-29 season and netted the first of 8 goals in 27 appearances. In 1929-30 he added a further 11 goals in 29 starts. Scoring 23 goals in 42 league starts in 1930-31, Houghton followed that up the following season with a further 16 goals in 33 outings. Ever-present in 1932-33, and another 13 goals, not surprisingly his form was being taken note of by other clubs. Ultiamtely he was sold to Norwich City in March 1934, where he made his Norwich debut against his former team, Exeter City.